If you know anything about Spokane, Washington you know something about the Davenport name. It’s historical The Historic Davenport Hotel is known as the first hotel in the United States to have air conditioning, a central vacuum system, pipe organ, and dividing doors in the ballrooms. When The Historic Davenport opened it was huge for the small inland city and slowly over the years it became in disrepair and was eventually closed. In the early 2000s The Historic Davenport was renovated to keep its historic charm and sparked a renewal in the Davenport name, now there are a small chain of Davenport hotels in the Spokane, Washington area including the Davenport Tower, Historic Davenport, Davenport Lusso, and the property that I stayed at Davenport Grand. All of these hotels are apart of the Marriott Autograph Collection thus they can all be booked through Marriott’s central website and even use your Marriott points to book the rooms. 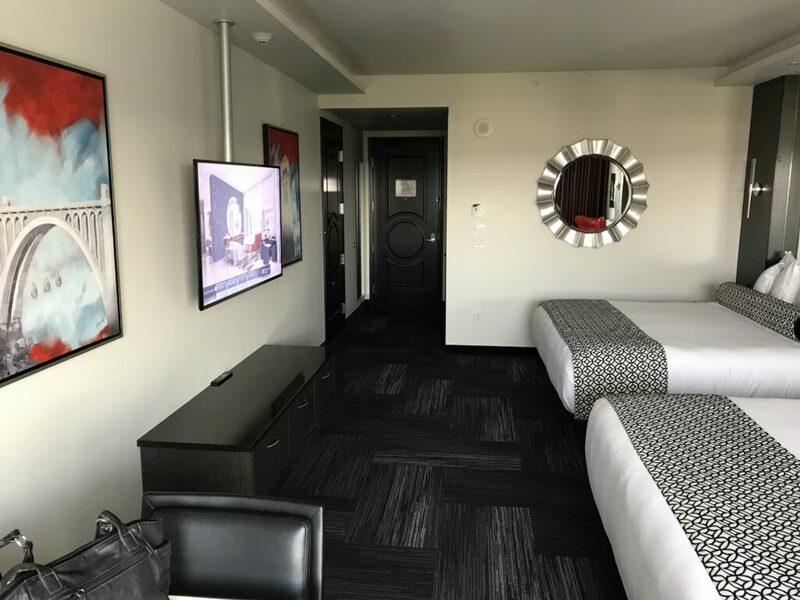 The Davenport Collection is apart of the Marriott Autograph Collection which makes booking a breeze through Marriott’s website and easy to redeem points which I did for this stay. I did a cash points redemption as I was splitting this room with a family member and agreed that they would pay the cash side. 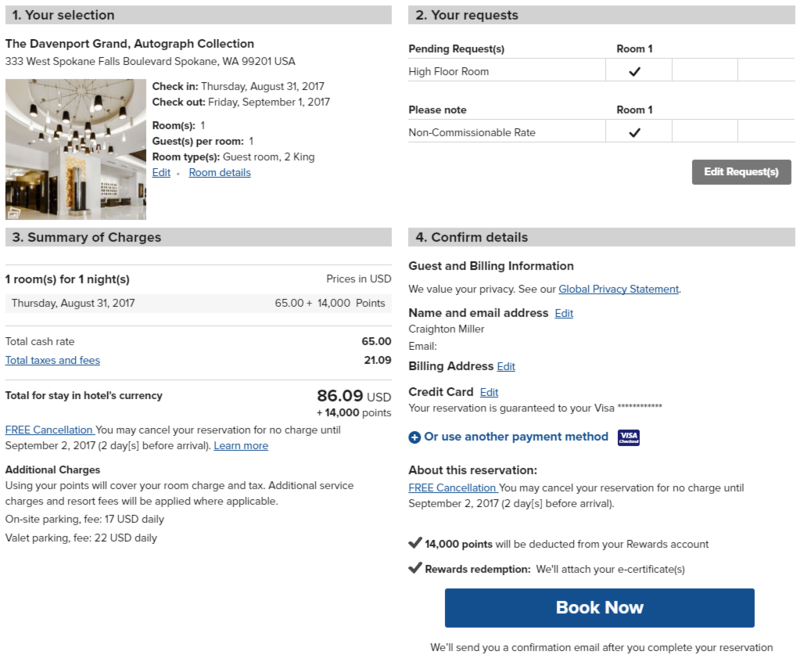 My double king room was booked at 14,000 points + $65 which probably isn’t the best rate but it was a last minute purchase. 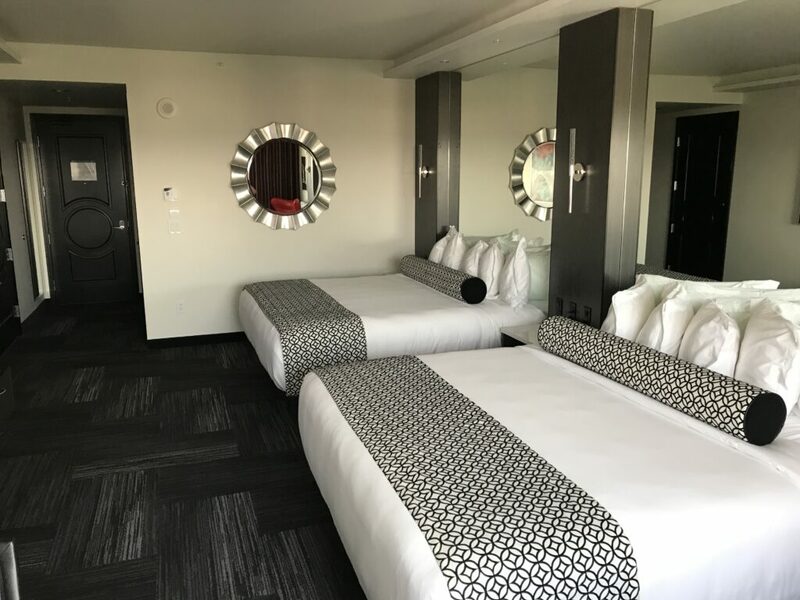 Arriving at the hotel was easy, they offer a very large and spacious covered parking area to unload your luggage with attentive bellboys ready to take your bags, self or valet parking, and grand views. 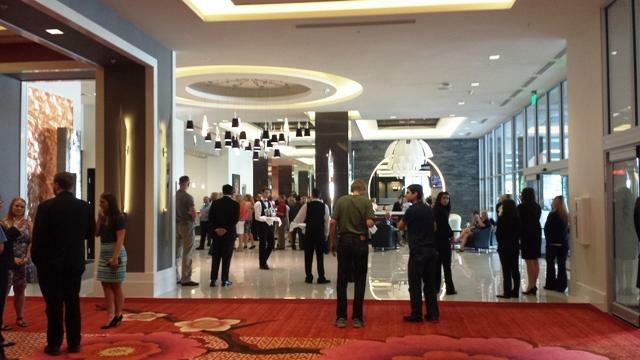 The lobby was very spacious and modern as the whole hotel is laid out that way. Check-in was as simple as showing my drivers license and asking if I’d like to take a free breakfast for two or bonus points as I’m an elite member with Marriott. Overall they were nice and welcoming and staff was eager to make sure I was acquainted with where everything was and pointing out all accommodations. For this trip I booked the Davenport Double King Room as I was traveling with some family members. The room was large and spacious, the beds were very large with many pillows and very soft. 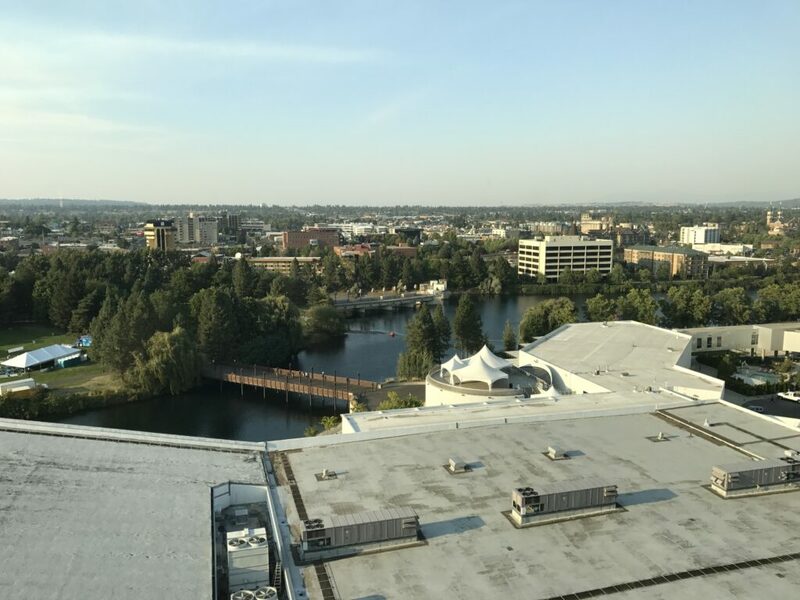 I had requested a high floor room to take in the views of the Spokane Downtown area, in this room we overlooked the convention center and out towards the park across the street. The room was acquainted with a nice work desk and some chairs for when you need to get some work done. I thought they were a little bit low for the height of the desk and was disappointed they didn’t adjust. Instead I ended up doing some of my work while laying on the bed. Speaking of the bed they were both very soft, I sunk right down into them from how soft they were. On the bed there were many pillows which were well needed as they didn’t provide much support and I ended up having to stack three together to get a good support for my head. Something that I didn’t do but the hotel offers different firmness of pillows and I could have requested different ones which I would probably do in the future. There is a TV mounted from the ceiling with a simple remote control. I ended up having some problems with the TV reception in my room, the signal kept getting lost and coming back then the audio got desynced from the picture making it hard to watch and so I just opted to do some web browsing. The bathroom was interesting, it had a Keurig for coffee which I through was much better than a coffee pot, but lacked with amenities. All liquids that you would normally use such as hand soap, shampoo, conditioner, body wash were all large bottles affixed to the wall instead of mini travel versions. On one hand it does save on plastic to produce all those mini-bottles but on the other hand it’s always nice to take those with you back home. I’m also a bar soap person rather than body wash, but that’s just getting picky. The point is that I got clean. 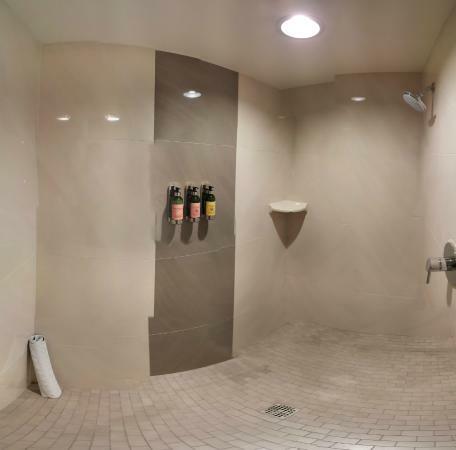 The shower area is interesting, both the toilet and shower stall are in the same side-room with a sliding door between the wash basin and it. One thing that I did appreciate was how large the shower was. In this hotel they opted to go for a walk in shower room rather than a tub. I’m not normally one to take a bath in a hotel and I do like having the large spacious shower so all was well in my book. Overall the room felt very modern, had everything I’d except a hotel room to have, wifi was fast and easy to connect to, and most of all the beds were very comfortable. I counted a total of three places to eat inside the hotel, not counting the coffee bar open in the mornings that serves some pastries to go. During my short stay I only dined at The Grand Restaurant and Lounge. Once for drinks they had a good selection of draft beers and a generous menu including dessert. I highly recommend the apple crisp with vanilla ice cream it was just the right amount of ice cream to apple. The crust was nice and crispy with melted sugar on the top and perfectly spiced apples. For breakfast it was a good place to grab a bite to eat to get your day started. I ended up having The Grand Breakfast which included a nice selection of eggs, hash-browns, toast, and bacon. It was reasonably prices and offered full meals or a menu to pick and choose what you want for breakfast. 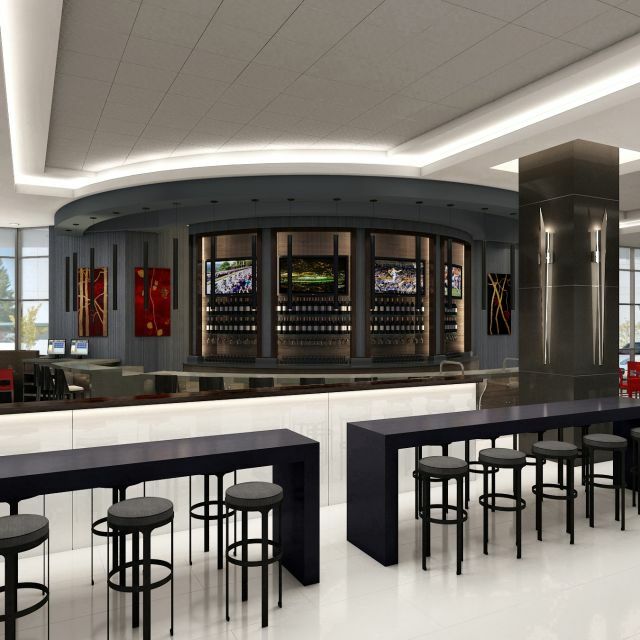 There is a second restaurant call The Grand Terrace Bar which has similar offerings to the The Grand Restaurant and Lounge. There is one specialty place to eat, Table 13. While I did not have a chance to dine there I did get to glance at the menu and it offered a premium dinner offering with small plate dinners such as sliders, short ribs, and crab cakes. The Grand offers a business center, spa, and pool all of which were well appointed and a little on the small size. For such a large hotel the pool did not seem all that big but if you think about it that’s not the hotel’s clientele. 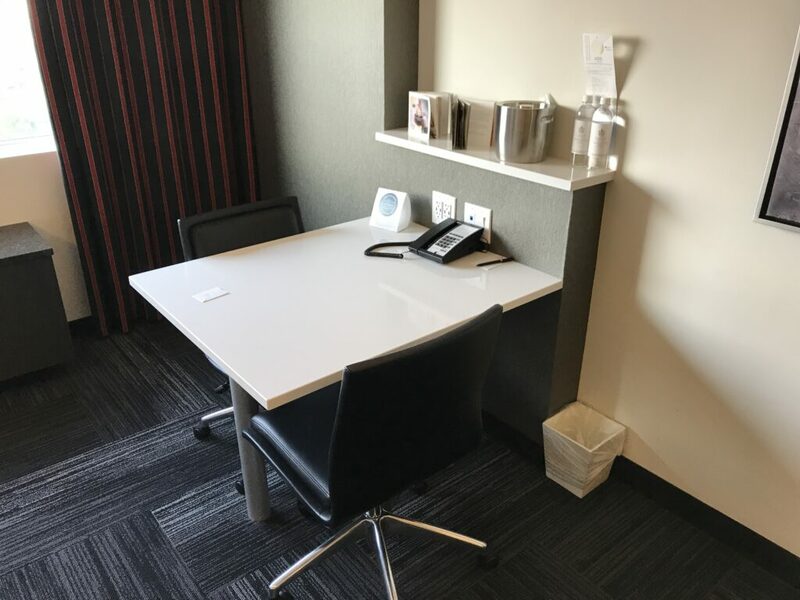 With its proximity to downtown, the convention center, and its own meeting space it’s defiantly geared more towards the business traveler. 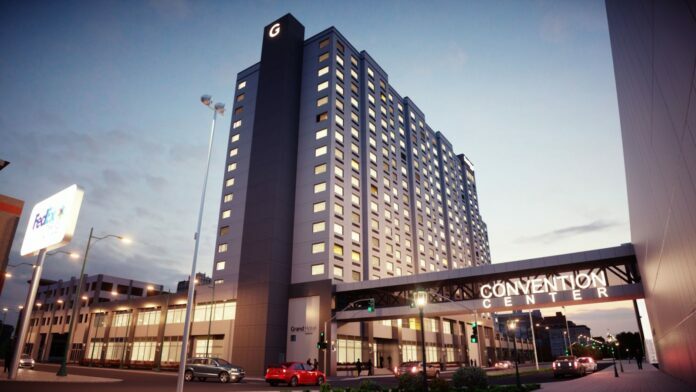 The Davenport Grand is the perfect balance between a modern hotel and classic hotel amenities. When staying at more modern hotels they sometimes take the modern aesthetic too far, this hotel pin points that with friendly staff, room layout, and room comfort. Everything was very spacious and added to the relaxing atmosphere that I was looking for. It’s defiantly on my list to visit again when I make another trip back to Spokane. The Davenport Grand is the perfect balance between a modern hotel and classic hotel amenities.